Day 11 continued testimony from Claremont McKenna politics professor Kenneth Miller, a witness for the Proponents of Prop. 8. 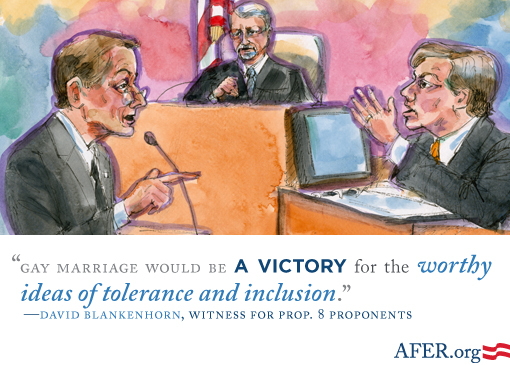 Then, the Proponents called to the stand David Blankenhorn to testify about marriage and the family. Blankenhorn is the founder and president of the Institute for American Values, a think tank that studies marriage in America. 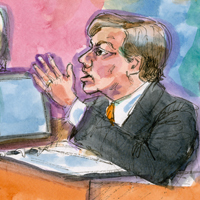 Yet, under cross-examination from AFER lead co-counsel David Boies, the witness revealed telling admissions. John C. Reilly reenacted parts of David Blankenhorn’s testimony at the Los Angeles premiere of the play “8,” which also included Brad Pitt as Chief Judge Vaughn R. Walker and George Clooney as attorney David Boies.